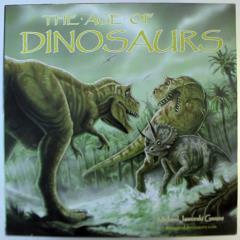 The Age of Dinosaurs is an interactive strategy board game. Theme: Players migrate populations of twelve dinosaur species across varying habitats in a quest to find food and avoid being eaten. Just as in a real ecosystem, each different species occupies its own niche, with different food requirements, fighting ability, speed, and favored habitats. The arrangement of the various habitats changes from game to game. To play the game well, a player must determine which combination of species will be most advantageous on a given board, and place their dinosaurs in locations where they will be able to find food and mates and avoid being eaten. Game-play: Play is organized into rounds. Each round consists of the players' turns and an End Phase in which the board is adjusted to prepare for the next round. Each player begins with 10 points of dinosaurs on the board, and increases this point total in two ways: (1) by successfully breeding dinosaurs to produce eggs, which hatch into new dinosaurs at the end of the round; (2) by introducing a new species during the End Phase. During a turn, a player rolls dice to determine the locations of new plant growth on the board, migrates dinosaurs to new locations, and attempts to feed and breed dinosaurs. For predators, feeding involves hunting other dinosaurs. Other players become involved with the current player's turn when their dinosaurs are hunted, and they must choose to fight or flee, and when they choose to play a card that impacts the current player's actions. During the End Phase, fresh kills become rotten carcasses, rotten carcasses rot away entirely, hungry dinosaurs starve, eggs hatch, and players have an opportunity to choose one of four improvements for the following round (various combinations of new dinosaurs, eggs, and cards). Goal: The game ends when at least one player has reached 40 points at the end of a round. The player with the highest point total at that time wins.